Every year, the Educational Theatre Association polls Directors from schools nationwide. One of the facts that they share from their research is which productions were the most popular over the previous year. This can help you as you plan your next show. It’s truly a great tool that helps us all to gauge the pulse of the contemporary theatre community. A recent issue of the Educational Theatre Association’s magazine, Dramatics, publishes the most recent results of their survey. (If you are a Director, Producer, or Set Designer who isn’t familiar with this publication, we highly recommend it.) There are a lot of familiar plays and musicals on the list, many of which you may have already tackled with your younger troupe. In the musicals category, the biggest news is that BEAUTY AND THE BEAST has been dethroned as the number one show. In the Plays category, Shakespeare’s A MIDSUMMER NIGHT’S DREAM won out. Without further ado, here are the top theatrical productions by category. No real surprises here. SHREK is a relatively new release and everyone from directors to audiences love the story and score. Classics such as WIZARD OF OZ and GREASE are longtime favorites that will likely show up on lists like this for years to come. One thing to watch out for next year is that INTO THE WOODS will likely move up. Disney is releasing a full-length cinematic adaptation of the musical in coming months. The new film will certainly bring this twisted fairy tale to the forefront. These shows all have a diverse set of scenic needs, but can be shared according to your exact vision with the many resources that are available. As usual, Shakespeare dominates the high school play category. With a collection of well-known works that tie into regular curriculum, the entire Shakespearean catalog is ideal for high school-level productions. (The lack of licensing fees doesn’t hurt, either!) THE CRUCIBLE and THE IMPORTANCE OF BEING ERNEST are two classics that we love and are happy to see that they are still popular with Directors around the country. 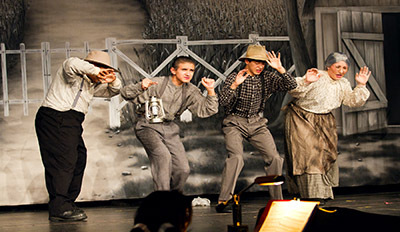 We work with a good amount of university and high school level Directors who feature both musicals and plays during their production seasons, in order to provide a well-rounded theatrical program for their students. Each and every show on this list is a great option for younger casts and tech crews. From contemporary storylines to classic literary works, there is a production to suit every troupe on this list. Looking ahead, we predict that many of these shows will stay on the list for 2014. With new shows like MARY POPPINS and THE ADDAMS FAMILY being released recently, there will also likely be a couple of new names. We would love to hear about what you are planning for the remainder of 2014 and 2015. Feel free to let us know what your troupe will be up to in the comments section. This entry was posted in 25th Annual Spelling Bee, A Midsummer Night's Dream, Backdrops for Plays, Choosing Your Production, Godspell Backdrops, Grease, Hairspray, INTO THE WOODS, Little Shop of Horrors, Production Photos, Romeo and Juliet, SHREK The Musical Backdrops, Theatre Backdrops, Theatre Trends, Thoroughly Modern Millie, Wizard of Oz, You're a Good Man Charlie Brown and tagged 25th annual putnam county spelling bee, Beauty and the Beast, Godspell, grease, hairspray, into the woods, little shop of horrors, midsummer night's dream, musical theater, Plays, professional backdrops, romeo and juliet, theatre trends, TheatreWorld backdrops, Theatrical backdrops, thoroughly modern millie, Wizard of Oz Backdrops, you're a good man charlie brown, younger theatrical groups, youth theater on November 25, 2014 by Skip Mathews.